Beautiful design and even better looking in the flesh than it looks in pictures. Build quality is excellent, although the stock fans are quiet rather than silent. There is a worrying lack of clearance between the graphics card and the power supply - only about 5mm. This doesn’t seem to be a problem in my case, but I was careful to choose a power supply that was only 140mm deep. If I hadn’t already had the Asus Strix GTX 960 I would have chosen a blower style card. A second 140mm front fan can easily be fitted if necessary. The SSD mounts, particularly those behind the motherboard, are problematic if your power supply has the usual right-angled SATA power connectors. You really need a straight connector. Cable routing requires some thinking about and I can’t help thinking that the case has been compromised for the sake of accommodating custom water cooling which I’m sure only a small minority of users will install. I really like the look and size of this case. Came from the cm130 elite case and this feels much bigger and easier to work in, but fact is that its not that much bigger. Slimmer but higher. Cable management was a dream compared and qulity feel is higher. Cooling wise its a lot better with many possible solutions. Wanted the window case first but i found this one at a local store with damage to the cardboard box it shipped in to a reduced price, no damage to the case tough. 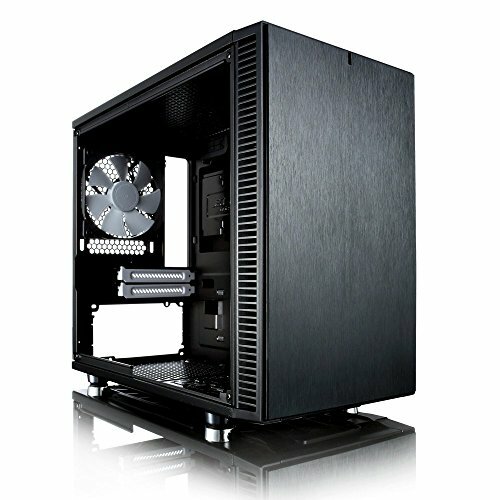 Great case, well built, and very easy to work in. Yes, it's a bit cramped, but there's not much choice at this size. Fans are pretty quiet becoming slightly audible only under load. The dust filters are easy to get at from the front of the case. The front panel feels ever so slightly mushy when inserting headphones or a USB cable. The side panels don't site very snugly, it's not an issue at all so far, but I can see it rattling a bit if something starts vibrating the case. The screws, or more specifically the screw holes feel like I'm going to strip them when tightening some of the screws. I'm not sure how to describe it, you know when you line up a screw with the hole perfectly and it screws down nice and smooth. Not really happening on this case, specifically on the side doors and the two HDD attachment flaps. I've closed and opened it up a good half dozen times now and it's all still good, so it's probably just in my mind. That's it, very minor, Compared to my last PC case it's a dream, but compared to my old iMac (First-gen aluminum, so it was pretty easy to open up once I got a big suction cup) it's not quite the same level of finish. Not a fair comparison by any means, but speaks highly to this cases quality. This case might be small but it's got a surprising amount of space to work in, I enjoy the aesthetic and simple look and feel. This thing is delightful to build in, and physically stunning. I don't miss the side-panel window at all, especially with poor cable-management skills like mine. Nearly everything is removable, and the interior is very clean. The magnetic radiator cover-flap will stop your ceiling from being coverred in pin-hole shaped led glare, and the replaceable PCIE covers give this thing a very premium finish. The side-panels are noise-proofed, and include thumbscrews, which should damn well be the industry standard already. In short, not a single complaint. Love this case, it has great cable management options even though it's small. This was an easy itx case to work in, lots of space, and easy cable management, however, there is little clearance for atx psu, and a full-size graphics card. There is no dust filter for the top modu-vent, dust is always a worry with more fans, also to TG, which is fine, but could make it a stunning case. overall very happy, but missing a few things.